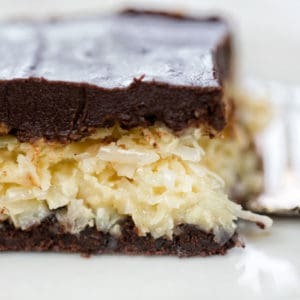 These Almond Joy Bars are a coconut lovers dream come true! 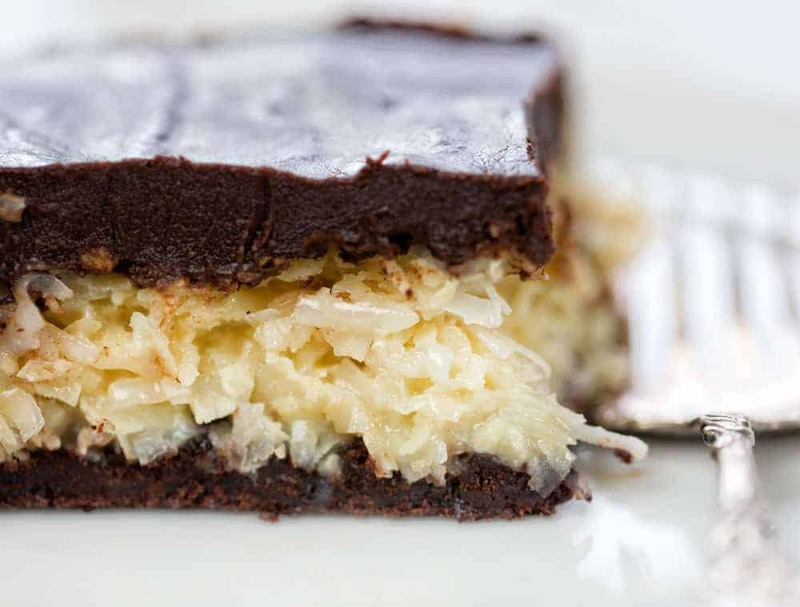 Rich gooey coconut filling over a chocolate cookie crust and topped with a decadent ganache. It’s perfection! This recipe is a loose interpretation of an Almond Joy candy bar. 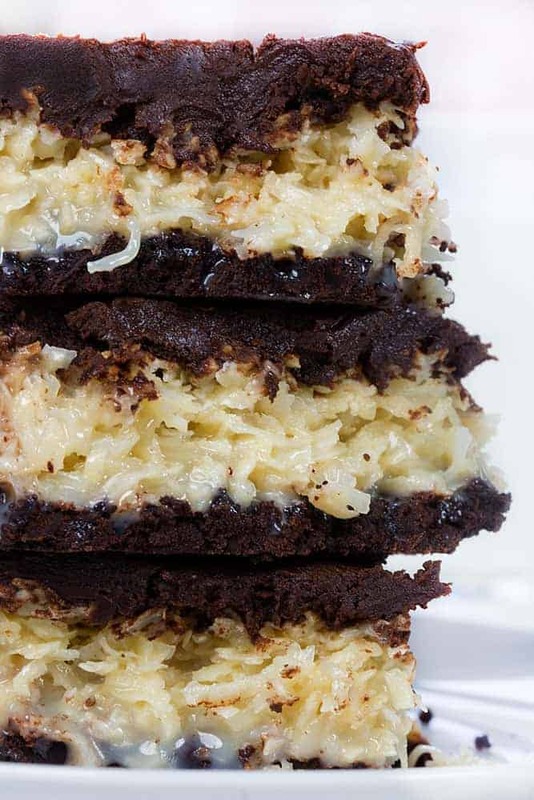 It is a chocolate cookie layer with a gooey rich coconut cream layer and then dark chocolate ganache on top. It is a chocolate lovers dream come true. 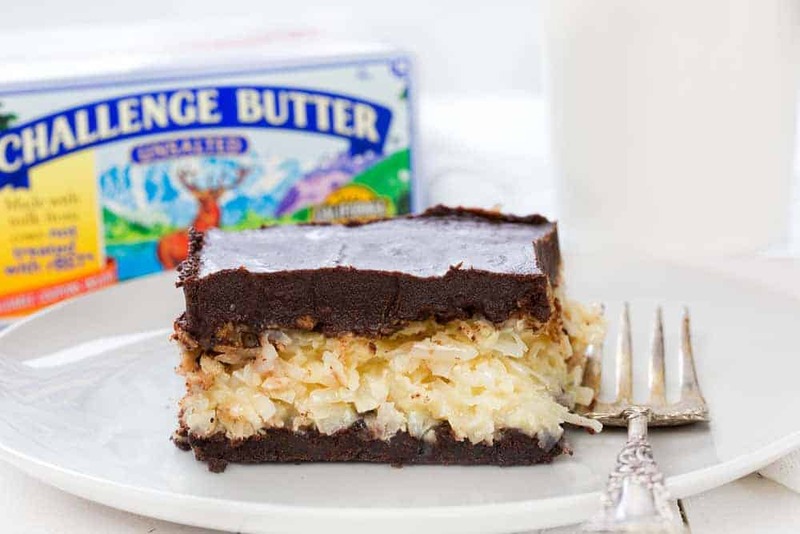 Even if you are not a huge coconut fan, you are going to enjoy these bars! The second most important ingredient is chocolate. 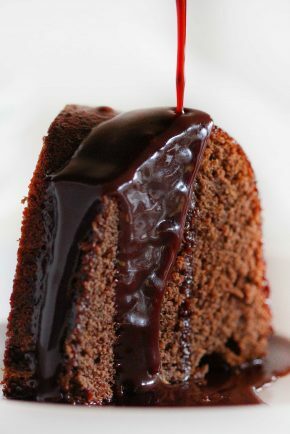 There is a LOT of chocolate in this recipe and not only is there a lot, but it is also dark chocolate. I found that dark chocolate crust and the dark chocolate ganache were perfectly complemented by the intensely sweet coconut filling. After a lot of testing, I settled on a recipe that uses butter and whole milk. As a general rule, the more simple a recipe is, the more important it is that you use the best quality ingredients. I do recommend using the best quality butter you can find (like Challenge!) and a good quality chocolate. My butter + milk recipe is essentially trying to mimic traditional ganache that uses equal parts heavy cream and chocolate. The recipe I am sharing is more of a thick ganache, one that you can pour initially, but that hardens enough to hold its shape. Also, be advised that this recipe is specific to a dark or bittersweet chocolate as a milk chocolate or white chocolate will not behave the same. 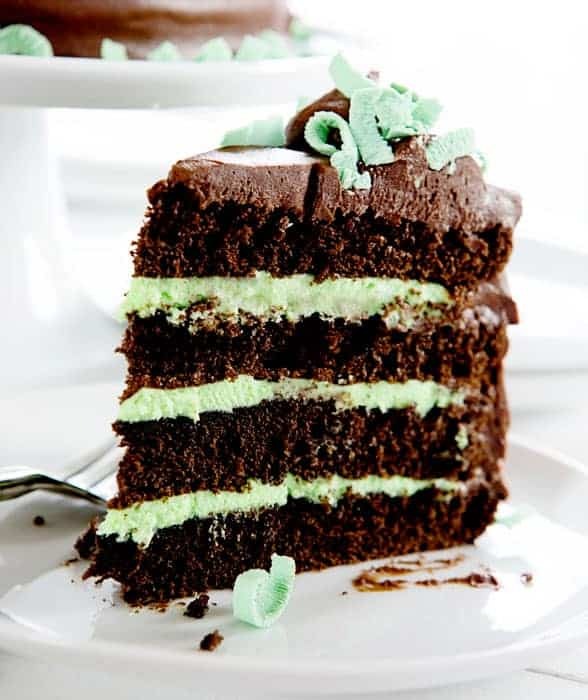 If you follow these tips, you are sure to create a perfect ganache! 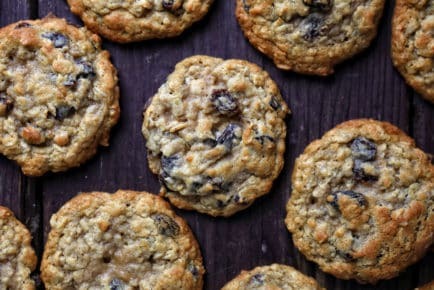 Try to not use chocolate chips as they can have a coating on them. I used dark chocolate chunks in my video, but you can also buy a good quality chocolate bar. Just be sure to finely chop it and get your pieces uniform. When melted the butter, try to avoid boiling it. The butter and milk should simmer and be very warm, but not boiling. If your butter mixture does boil, be sure to let it sit for a few minutes before pouring over the chocolate. After pouring the butter mixture over the chocolate, allow the butter and chocolate to sit for a couple minutes. Because I wanted my ganache to be thicker I used a whisk to “whip” the chocolate. Adding in the air while whisking also helps it to thicken. If you were to use a spatula, the consistency doesn’t change dramatically, but it may not be as thick. I would be silly not to mention that amazing bottom crust layer. I am not kidding you, it tastes just like an oreo cookie! You get all of the benefits of the delicious flavor and are using real, whole ingredients. 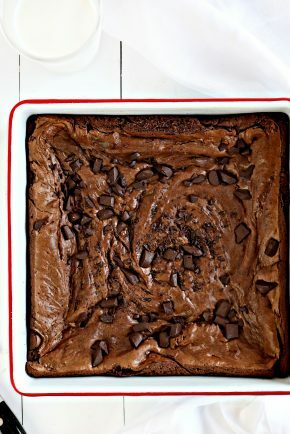 Feel free to use the chocolate cookie recipe in place of every recipe that calls for an oreo cookie crust! These bars are seriously decadent! People often beg me for the recipe! Pour chocolate crumbs into a greased 9x13 baking dish and press into an even layer. In a large bowl combine the condensed milk, coconut flakes, and coconut extract. Stir until ingredients are fully incorporated. If the mixture seems too dry, let it sit for a couple minutes and it will appear to have more moisture. Spread the coconut mixture over the chocolate crust and smooth into an even layer. Bake for 20-22 minutes or until it starts to brown. A few random flakes might turn dark brown, but the overall crust should not burn. After the coconut bar has cooled a bit, add almonds on top. You can place them all over or 1 or each individual bar. Pour chocolate into a medium to large bowl. Set aside. Place butter and milk in a medium saucepan over medium heat. Cook about 5 minutes, stirring occasionally. Do not allow milk to burn. 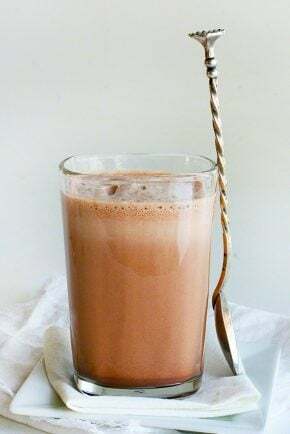 Pour chocolate over warm coconut and then place in the refrigerator for at least 1 hour, or until chocolate has set. Thank you for supporting the brands that support use here at iambaker! 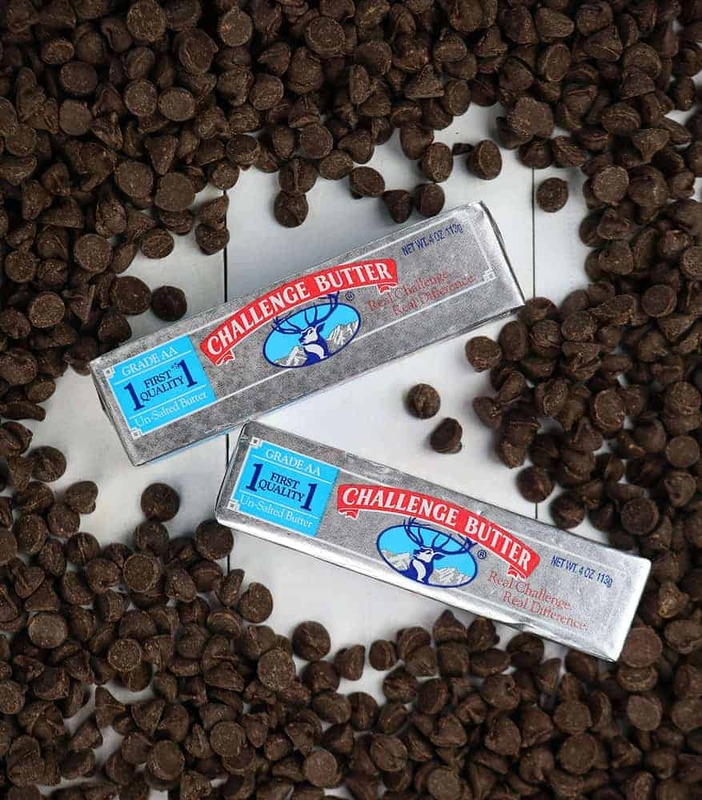 It has been a dream of mine to partner with Challenge Butter and I am just thrilled to be able to share a product that I love and use! Your site has now become too difficult to read. Too many ads. I realize that it’s necessary but, I get frustrated trying to read the recipes with all the ads interfering. I give up and leave. Do you have a cookbook ? This recipe looks amazing. I’m considering making it to take to a family gathering, but would have to prepare it before traveling. How many days do you think it would keep if I have to make it several days ahead of time? The chocolate may start to spot after 24 hours… but you could sprinkle the top with shredded coconut when you got to the event if that happened. I think 48 hours is just fine to keep it refrigerated! Looks fantastic! 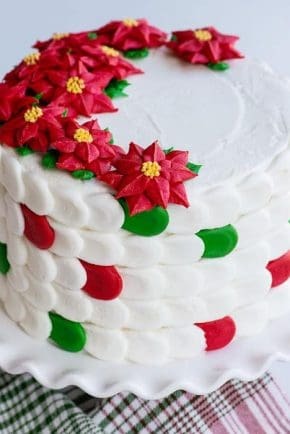 I can’t wait to make this for our holiday celebration! Thank you for so many great recipes and photos. You are my go-to source for fun recipes!! In your video it is stated that evaporated milk is used, but the ingredients list condensed milk. It’s obviously condensed milk but you may wish to edit that. I didn’t have enough coconut for the full amount of filling so I wound up halving it (coconut, sw. cond. milk, and coconut extract). There was plenty to cover the base and I baked it for about five minutes less than directed. Also, made only 2/3 of the chocolate topping. Although next time I’ll make it with the proper amounts, it turned out to be delicious. We didn’t have a problem with it being heavy on the chocolate. Very decadent! Extremely rich and a lot of chocolate. Next time I would definetly cut the recipe in half. It makes a lot and you can really only eat a very small amount.i was going to make these for Christmas but my oven broke so I made them yesterday for an engagement party and everyone loved them!